Gorgeous, funny, and wildly uninhibited, her exes are a veritable Who's Who of Hollywood power players. At 28 (31), she is blessed with a firm (if curvaceous) bod, a designer wardrobe, a Daddy-subsidized apartment, and an A-list speed-dial. We are talking Uma people. YES -- Chick flick. Yes - less funny than advertised. Good enough plot, as chick flicks go, but this is all about narrator. From a 3 to a four just because of Uma! Not exactly a classic literary masterpiece, but a reasonably entertaining, light-hearted chick-flick. Very well-read by Uma Thurman. I enjoyed this - Uma Thurman did a fantastic job reading it, and the character of Clarissa is fun to hate. I enjoyed the first half more than the second half, but the "twist" part was interesting. It was a fun book, light reading and ok. I am a little past this age group though so I would say someone younger would enjoy this more. It wasn't funny like I expected. If you are under 30 you will enjoy this. 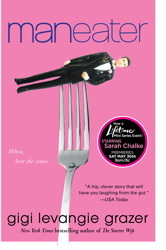 Very entertaining...definitely "chick lit" material. Uma Thurman was an excellent reader...she kept you interested in the story and represented the characters well. So very boring. Seriously! I kept listening hoping it would get good and never did. the equivalent of a 'chick flick' in a book. A real trashy novel. It is what it sayes it is, pure trashy escape. Beautifully read. Loads of fun! What a great book! Witty, well narrated and simply hilarious! I recommend it wholeheartedly! The characters were so bored with life and they bored me. Don't judge by the beginning, this shapes up to be an entertaining story. Good chick lit.